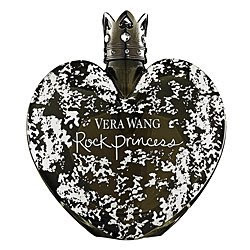 Vera Wang Rock Princess is all about the music, the fashion, and the spirit with this edgy yet seductively sweet essence. The dark, fruity scent channels sultry rock-star attitude with a blend of white peach, red raspberry, bergamot, heliotrope, rose, jasmine, lily, cashmere wood, musk, iris and coconut. The Rock Princess bottle is as rebellious and dark as the downtown clubs where she plays, with a smoky glass heart topped by a rhinestone-studded gunmetal crown. This giveaway has a retail value of $70! Entering is easy. Simply enter your name and email address in the box below. The winner will be selected on Friday, May 22 and notified by email. It's that simple! This giveaway is open to US residents only. Giveaway runs until Thursday, May 21 at midnight. One entry per person, email address and IP address. Multiple entries will be disqualified. I've been wanting to try this perfume! AAH! If I could win any of your giveaways... it would probably be this one :) awesome! The notes of Rock Princess are truly intriguing. Love to try it. I would love to try this perfume! This contest has the best of both worlds...an awesome Vera Wang fragrance that I want to try so bad and an Itunes card that I could use to fill my iPod with all my favorite artists from the concerts that I'll be attending this summer!! Stellar giveaway!! Oh, I would love to win this! Love Vera Wang stuff. I have never tried Vera Wang perfume but would really like to. The itunes would be nice too. Love Vera Wang products...creative lady. Love iTunes...in fact, right I'm listening to my iTunes playlist! I love the aroma of Vera Wang@!